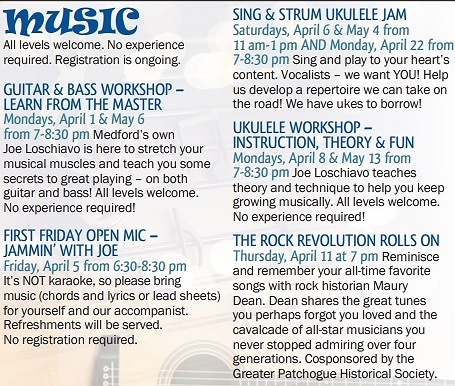 Subject: LongIsland.com - Your Name sent you Event details of "Guitar and Bass Workshop with Joe LoSchiavo"
Let Medford's own Joe LoSchiavo help you stretch your musical muscles! Have fun and learn secrets to great playing. All levels welcome. Acoustic guitar, bass and Ubass. No experience or preregistration required. This event is free and ongoing! Refreshments served!